The Soyuz MS-09 crew spacecraft from Roscosmos is pictured docked to the Rassvet module as the International Space Station was flying into an orbital night period. With the station’s cabin pressure holding steady, most of the crew pressed ahead with a variety of scientific experiments. Station Commander Drew Feustel of NASA prepared tools to be used in a pair of spacewalks late next month to complete the change out of batteries on the port truss of the outpost. Six new lithium-ion batteries will be transported to the station in September on the Japanese HTV Transfer Vehicle, or HTV-7 cargo craft, that will replace a dozen older nickel-hydrogen batteries in a duplication of work conducted last year on the station’s starboard truss. Flight controllers at the Mission Control Centers in Houston and Moscow, meanwhile, continued to monitor pressure levels on the station following the patching of a small hole Thursday in the orbital module, or upper portion of the Soyuz MS-09 spacecraft. 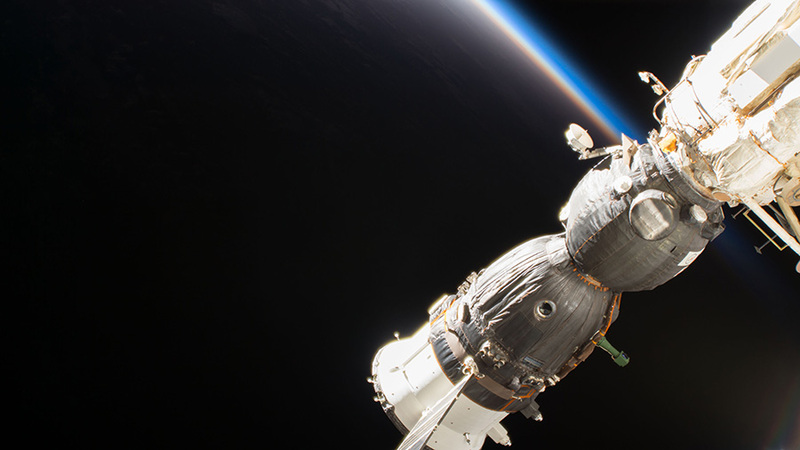 The Soyuz is docked to the Rassvet module on the Earth-facing side of the Russian segment. The tiny hole created a slight loss in pressure late Wednesday and early Thursday before it was repaired by Soyuz commander Sergey Prokopyev of Roscosmos. The crew plans a quiet weekend before embarking on a busy schedule of research and routine maintenance work next week. Hi Aimee — The astronauts aboard the space station relaxed on Labor Day taking time talk to family, read books, watch movies and of course look out at the Earth passing below.